Home / Antike / Filip V / Geschichte / Rom / Rom raubte so viel Gold aus Makedonien das die Römer keine direkte Steuern mehr zahlten! Rom raubte so viel Gold aus Makedonien das die Römer keine direkte Steuern mehr zahlten! Rom und Makedonien fochten fast 50 Jahre in den "römisch-makedonischen Kriegen" um die Vorherrschaft um das antike Griechenland, die Griechen verbündeten sich später mit den Römern um sich vom "makedonischem Joch" zu befreien. Zusammen mit mehreren griechischen Stadt-Staaten schlugen die Römer die Makedonen und Griechenland selbst wurde vom römischen Feldherrn Flaminius für frei erklärt. Daraufhin zerstückelte die Besatzungsmacht Rom Makedonien in vier Teile. Als Disput zwischen Makedonien und Rom wird auch oft die politische Haltung Makedoniens zitiert, denn Makedoniens König Filip V verbündete sich im Jahre 215 v.Chr. mit Roms großem Kontrahenten Hannibal und Filip der fünfte zog auch als erster gegen Rom in die Schlacht. Auch die Tatsache das mit dem neu erschaffenem römischen Protektorat "Illyricum" eine direkte Bedrohung für Makedoniens König an seinen Landesgrenzen bestand, so das das Bündnis zwischen Filip V und Hannibal zur damaligen Geo-politischen Lage verständlich erscheint - Hannibal schlug zwei Jahre davor die Römer mehrmals während dem (zweitem) punischem Krieg. Im makedonischem Volksmund und auch in den Legenden wird oft von dem "Hass den die Römer gegen die Makedonen zeigten" gesprochen. So sollen die Römer "alles zerstört haben was auf die Hegemonie der Makedonen über Griechenland schließen ließe", schließlich fochte man drei schwere Kriege gegen die Makedonen - und "aus Makedonien so viel Gold geraubt haben, so das heute keine makedonische Goldmünze zu finden sei". Als kleine Anmerkung: Gold als Prägemittel war in diesem Kulturraum nicht selbstverständlich, aber Makedonien verfügte über ausreichend Gold-Minen. A rare Macedonian tetradrachm, minted around 147 B. C., tells a story from the beginnings of the Roman province of Macedonia. The rarity is to be auctioned off in the upcoming Künker autumn auction sale to be conducted between the 7th and the 11th October 2013. In the summer of 168, Perseus, the last Macedonian king, gave up in the face of the strike capability of the Romans. In order to spare his nation’s blood, he went into captivity himself. It didn’t take long for the Macedonians to long for the old royal dominion again, though. The Romans had hesitated to assume direct administration of that vast and rich territory. Otherwise, individual Roman nobles would have gained such great a power that the carefully balanced equilibrium at home would have been jeopardized. Instead, the defeated ones were forced to accept a Republican constitution. 100 talents, i.e. exactly half of the hitherto royal taxes, had to be paid directly to Rome. Quite soon, however, the country’s economic activity diminished to such an extent, that the Macedonians had real problems to raise even that sum. The Romans had divided Macedonia into four districts that weren’t allowed to maintain any economical (and, for that matter, social) relations. The most important source of income, the gold and silver mines, were forced to close down for ten years. Importation of salt was prohibited. That wasn’t just a culinary nuisance but also meant that an important way of curing food was no longer available. Naturally, lumber for ships could no longer be felled to the effect that the Macedonians could no longer build ships, be it war ships or trade ships. The Macedonians were only allowed to keep border troops which would serve as bulwark against the assailing nomadic tribes from the north – that really was an important task for Greece. While these troops used to have been financed by royal revenues, the economically weakened country had to bear any costs for defense and infrastructure in addition now. In contrast to the Romans, who had gained such profit out of the Macedonian royal treasure that they were able to mostly dispense the Roman citizens from direct taxation from that moment on, the once so wealthy Macedonia descended into poverty, slowly but surely. The time was ripe for an upheaval. The catalyst was a man called Andriskos. We don’t know much about him. His enemies supposed he was an adventurer from Adramytteion in the Troad. He, in contrast, claimed to be the son of Perseus and Laodike, hence rightful heir to kingship. Apparently, Andriskos had turned to his uncle Demetrios I of Syria for help, only to be turned in to the Romans by him. How Andriskos managed to escape from Roman prison we don’t know – in any case, he resorted to the peoples in the north. Aided by Thracian troops, he conquered major parts of Macedonia and even gained a great victory over a small army of the Romans. But when the senate sent Q. Caecilius Metellus and his army to Macedonia, Andriskos didn’t stand a chance. The decisive battle was fought in 148. The Thracians were defeated, Andriskos taken hostage and dragged along in Metellus’ triumph only to be killed afterwards. Picture:The rare tetradrachm with a first-class provenance dating back as early as 1900 comes from the beginning of direct Roman dominion over Macedonia. It will be auctioned off between the 7th and the 11th October 2013. 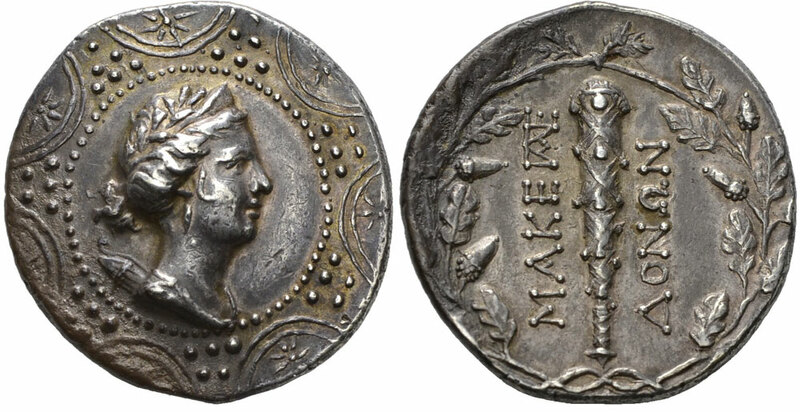 In all probability, it was during the year after the Roman victory over Andriskos that a markedly rare tetradrachm was minted, which is going to come up for auction in the next Künker autumn sale between the 7th and the 11th October 2013. It has a striking resemblance with the much more frequent tetradrachms minted after the defeat of Perseus in 168 that mostly come from the first Macedonian province. The die cutting of the specimen illustrated here, though, is much finer, and the legend differs clearly. 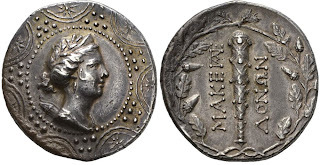 It doesn’t state a district of the country but the name of the entire empire: MAKEDONWN – coins of the Macedonians. Although we lack the ultimate proof, most of the numismatists now follow Pierre A. Mackay, Macedonian Tetradrachms of 148-147 B. C. (ANS MN 14), p. 15 et seq., who dates this coin type to 147. The legend’s change from LEG MAKEDONWN to the simple MAKEDONWN is said to be associated with the end of the military regime after the victory of Metellus and the restoration of the Macedonian “autonomy”. The Romans pretended the Andriskos affair to be a mere external matter. Not the discontent in the country but the evil neighbors in the north were the alleged reason. 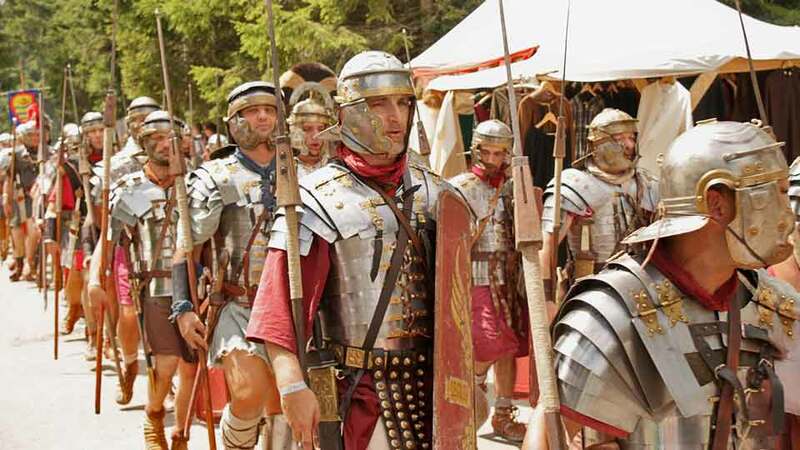 The senate, nevertheless, initiated an administrative reform by sending a Roman governor into the province and charging Roman troops with securing the border. Such a drastic measure was nothing extraordinary in those years. The Romans began to actively interfere in the Mediterranean region. They suspected (with good reason) resistance against their rule at many places. One year later, they destroyed Corinth, because the Achaean League wasn’t willing to partially dissolute. In the same year Carthage fell, for equally egoistic reasons. The Macedonians, however, apparently accepted their fate. At least, Rome offered protection against Thracians and Celts. As a result, Macedonia became a thriving province again. Macedonia connected the west with the east, Italy with Asia Minor. Thanks to its interurban road, it became a historical focal point that witnessed many events which changed the course of world history.